The May Court Club of Oakville is part of The Association of May Court Clubs of Canada, the first service club in Canada and founded in 1898 on the eve of May Day in Ottawa, Ontario. May Court’s founder, Lady Isabel Aberdeen, the wife of Canada’s then Governor General, was a truly extraordinary woman. Lady Aberdeen had strong ideas about the role of women in society. More importantly she put her ideas into action. She was the founder of the Council of Women and the Victorian Order of Nurses (VON). 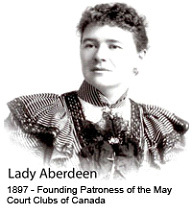 To support these endeavours, she then founded a women’s service club, The May Court Club. Over a century later, May Court Clubs have grown to more than 1,500 volunteer women located in nine Ontario cities driven by the same spirit and passion for making a difference in the communities they serve.